Evaluation of various intracranial cystic lesions using CT and MRI at a tertiary hospital in central Gujarat. Evaluation of various cystic lesions of neck using CT and MRI at a tertiary hospital in central Gujarat. Authors: AminSS1 , Pandey AS2* , Daxini AB3 , Patel DS4 , Modh DA5. Authors: Desai HV (MD Pulmonary Medicine) 1, Daxini AB 2*, Pandey AS 3, Raval VK (MBBS) 4, Modh DA5. Authors: Harita Desai1* , B.Ramesh2. Authors: 1Dubey Sanjay (MD) , 2*Gharia Amit (MD) , 3Pandey Ved P (MD) . Authors: Mohit Sharma1*, Mahesh Patel 2, Vinod Dhakad3, Nayan Gupta3, Abhinav Deshpande3, Ruchit Kansaria3. Authors: *1Patel Manthan 2Patel Poonam. Authors: Dr. Bhumikaben P. Suthar1* , Dr. Divya Vaid2 , Dr. Pukhraj P. Suthar3. Pattern Of Sudden Death Cases Brought For Postmortem Examination At Sir T. General Hospital, Bhavnagar. Small Incision preperitoneal (SIP) repair for inguinal hernias—A study of 300 cases. Authors: *1Adeesh p. Jain, 2Atul K Saxena. A Cross sectional studies of Association between Pioglitazone and Bladder cancer In Indian Population with type-2 Diabetes. Authors: Dr. H.D.Ahir1*, Dr. Aanal shah2, Dr. Utkarsh Parmar3, Dr. N.N.Pandya4. 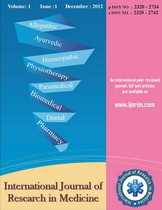 Authors: Dr. Bhaskar Thakkar 1, Dr. Pragnesh J. Patel*2, Dr. Urvashi Mangar3, Dr. Paresh Shiladariya4, Dr. Nikunj B. Suthar5, Dr. Pallav Patel6. Predictive Role Of Foot Anthropometry For Estimation Of Stature In Females Of Bhavnagar - Gujarat. A Study Of Estimation Of Stature From Measurements Of Hand In Males Of Bhavnagar - Gujarat. Recto-Urethral Fistula (RUF): A rare complication of endoscopic Posterior Urethral Valve (PUV) ablation in a child. A rare case of permanent complete heart block.